Two teenagers have died and 17 other people are wounded after a shooting at a Kentucky high school this morning, Kentucky Gov. Matt Bevin said. The suspect, a 15-year-old male student, was taken into custody, Bevin said. Fourteen people suffered gunshot wounds, including the two victims who died, Bevin said at a news conference. A 15-year-old girl died at the scene and a 15-year-old boy died at the hospital, Bevin said. On Jan. 23, 2018, emergency crews respond to Marshall County High School after a fatal school shooting happened in Benton, Ky. Emergency crews respond to Marshall County High School shooting, Jan. 23, 2018, in Benton, Ky. The shooting took place just before 8 a.m. local time at Marshall County High School in Benton, Kentucky, about 120 miles northwest of Nashville, Tennessee. Waymon ran to McDonald’s, struggling to breathe, the AP said. “All I could keep thinking was, ‘I can’t believe this is happening,'” she said, according to the AP. Authorities investigate the scene of fatal school shooting, Jan 23, 2018, in Benton, Ky. The scene has been secured, the state police said. It’s believed that everyone who was injured was a student. Google Earth image of Marshall County High School, Jan 23, 2018, in Benton, Ky.
Five patients, all males ranging in age from 15 to 18, were taken to Vanderbilt University Medical Center in Nashville, doctors there said. Among the patients was the 15-year-old boy who did not survive; he was shot in the head, doctors said. The four remaining patients there are expected to survive, doctors said. Bevin said the suspect will be charged with murder and attempted murder. Gov. Matt Bevin speaks during a media briefing at the Marshall County Board of Education following a shooting at Marshall County High School in Benton, Ky., Jan. 23, 2018. One student told ABC affiliate WHAS in Louisville that he was in the library when he heard what sounded like a fight. Parent Barry Mann told the AP his 14-year-old son called him as soon as he ran out of the school. “It sounded like his heart was in his throat,” Mann said, according to the AP. “All the parking lots were full with parents and kids hugging each other and crying and nobody really knowing what was going on,” local business owner Dusty Kornbacher told the AP. 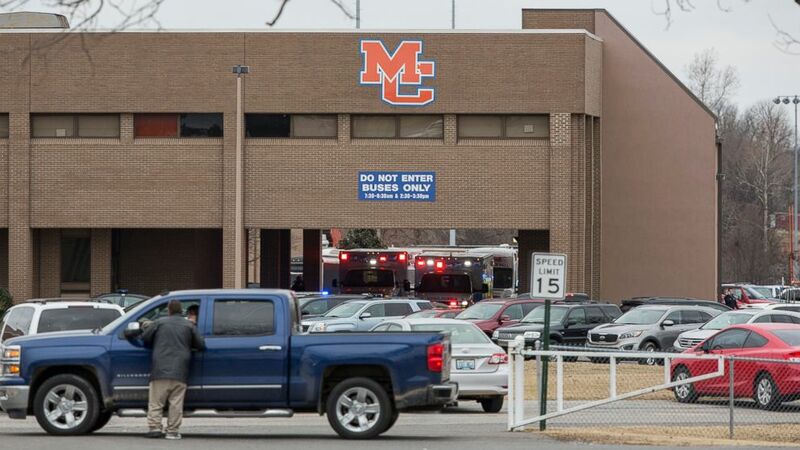 Emergency crews respond to Marshall County High School after a fatal school shooting, Jan. 23, 2018, in Benton, Ky. Authorities said a shooting suspect was in custody. Landon Kornbacher, who graduated from this high school in 2016, told ABC News he was in “shock” as his girlfriend was inside the school and on lockdown. “Never would have thought this would happen here,” Kornbacher said. Marshall County High School in Benton, Ky., as seen on Google Maps. White House Press Secretary Sarah Sanders said the president has been briefed on the shooting. “Our thoughts and prayers are with the families in Marshall County,” Sanders said. Closely tracking reports of the tragedy in Benton, #Kentucky at Marshall County High School and my thoughts are with the students, teachers, faculty, and the entire community. Thank you to the first responders who continue to put themselves in harm’s way to protect others. “The souls of Marshall County have been bruised and the fabric of the community has been torn, but the people of Benton, KY and the surrounding communities are strong,” the governor tweeted this afternoon. The school shooting in Kentucky comes a day after a 15-year-old girl in Texas was shot and injured in her high school cafeteria, allegedly by a 16-year-old male student. The 15-year-old was hospitalized in unknown condition. The Economy Needs More Workers. Last Month, It Got Fewer. September 7, 2018 Comments Off on The Economy Needs More Workers. Last Month, It Got Fewer. We’re 27. We’ve Been Together Just 9 Months. Here’s Why We’re In Couple’s Counseling. February 17, 2019 Comments Off on We’re 27. We’ve Been Together Just 9 Months. Here’s Why We’re In Couple’s Counseling.